April is Sjögren’s Awareness Month! April is Sjögren’s Awareness Month! To portray the entire patient experience, in our This Is Sjögren’s Awareness Campaign, the Sjögren’s Syndrome Foundation (SSF) is drawing facts and figures from our recent “Living with Sjögren’s” survey findings. This survey, which was conducted by Harris Poll on behalf of the SSF, gave the Foundation amazing data about how patients’ lives are affected by Sjögren’s, what symptoms and complications patients live with and how the disease affects their emotional and financial well-being. The independent nationwide survey, designed by Harris Poll along with the SSF and a volunteer committee of patients and healthcare providers, was mailed to Foundation members in the spring of 2016. Nearly 3,000 adults shared their experiences with the disease and its physical, financial and emotional effects on their lives. 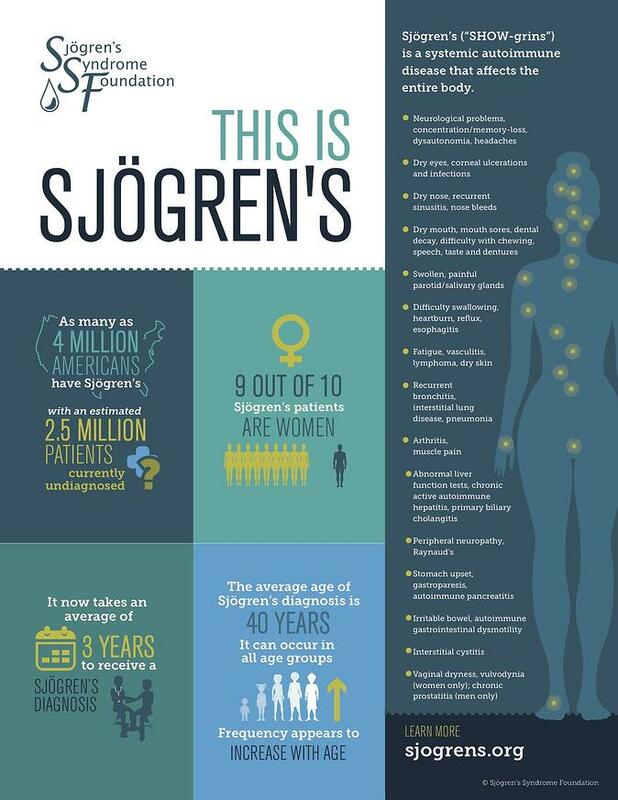 Every day the SSF is sharing a fact from these survey findings or other information about the disease on our social media accounts to show: This is Sjögren’s (#ThisIsSjögrens)! While the daily post give a small glimpse into Sjögren’s, by the end of April, we hope these 30 posts will show the complexity and seriousness of the disease. 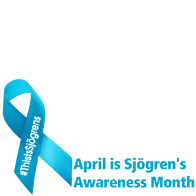 We encourage you to use April Awareness month and our #ThisIsSjögrens social media campaign, as a way to talk about Sjögren’s with your family and friends. Every post is an opportunity to start a conversation about living with Sjögren’s and how it affects you. The more others understand, the more support you can find. And know that we at the Sjögren’s Syndrome Foundation are here for you! We are committed to accelerating the development of better diagnostic, management and therapeutics that will have the greatest potential impact on improving the quality of life for Sjögren’s patients. Together, we will transform the future of Sjögren’s!